What’s happening. 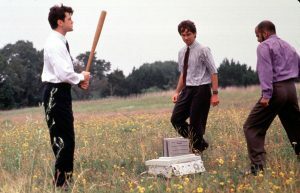 Yeah…we recalled Office Space (1999). We got the memo about the TPS reports, Jennifer Aniston being cool, and the stapler. But, uh, we’re gonna need a little reminder about some other things. Oh, and we almost forgot, Gertie (the dog) is very vocal in the first half of this episode. So…uh…yeah…we’re sorry about that. Thanks.